for the formation of lodges in California. In April 1850, before California became a state, representatives from five of these Grand Lodges assembled in Sacramento for the purpose of establishing a California Grand Lodge. They adopted a constitution and elected Jonathan D. Stevenson Grand Master. The Grand Lodge of California was now an official organization. Charters were issued and Masonry in California was under way. According to the Federal Census, the population of the state in 1850 was 92,579. By the year 1860 there were 130 Blue Lodges in California with a total membership of 5,055. The population had increased to 379,597. Mail service had been speeded by the Overland Stage Coach which linked St. Joseph, Missouri and San Francisco, a distance of about 2,000 miles. The weekly schedule averaged 23 days. On April 14, 1860 the first rider of the Pony Express reached San Francisco carrying the mail. The average time between the Mississippi and San Francisco was about ten and one half days. Transportation and communication to California was slow, but people were moving by land and sea west to the Land of Gold. Included in this courageous trek were Scottish Rite Masons from both the Northern and Southern Jurisdiction. 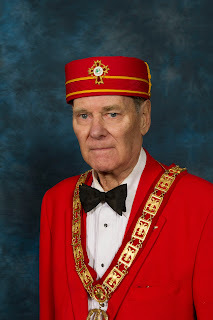 ion with members of the California Craft and had received numerous recommend- ations for the establishment of the Scottish Rite and for the appointment of an Active Member of the Supreme Council in California. At the Supreme Council Session held in Washington, D.C. during the month of March 1860, Albert Pike, 33 degree, made known in his address an earnest desire to extend the Rite to California immediately and to establish a Grand Consistory. Thus, on April 4, 1861 the Supreme Council met in New Orleans Masonic Hall and elected Milton V. Latham, a United States Senator from California and Sovereign Grand Inspector General in California and an Active Member of the Supreme Council. A week or so after this session the “War Between the States” began. This prevented Latham from more actively assuming his duties and responsibilities. (Part II continues next month).